There has been a controversy this week around a little bookstore on Manchester’s Oxford Road. On May 24, we will launch a biography of Leila Khaled, the young woman who hijacked a passenger jet in 1969. Leila Khaled: Icon of Palestinian Liberation by Sarah Irving is a compelling account of Khaled’s turbulent life. At the book launch, Sarah will explore Leila Khaled’s involvement with a radical element of the PLO, the rise of Hamas, the role of women in a largely male movement and Khaled’s activism today. I’m very sad to say that the Manchester launch of my Leila Khaled biography, which was due to take place a week on Thursday, has been cancelled. A very shaken staff member called me earlier to say that the shop had been subjected to a deluge of phone harassment since opening this morning, and that they simply could not cope… This is, of course, immensely disappointing, but I absolutely do not blame Blackwell’s for taking this decision, and they have been incredibly kind about it (I feel rather guilty about not foreseeing this and for putting their very sweet but rather literary staff through this!). It is, of course, a measure of the desperate rearguard action which apologists for the actions of the State of Israel are currently fighting that they feel the need to close down all debate and discussion of issues around Palestinian history, politics and culture. It’s also worth noting that some of the callers hadn’t even bothered to properly find out what the event was – they thought that Leila Khaled herself was planning to appear, something which is currently impossible because she is denied visas by the UK government. But it is revealing that Zionist campaigners are happy to close something down when they don’t even know what it is. I know many of the people involved with Manchester Blackwell’s. It’s an amazing shop, just opposite a great cluster of Oxford Road bars, and its staff have done a hell of a lot for the litscene in this city. I remember Fat Roland telling me at the Manchester Blog Awards that ‘I employ half of Manchester’s blogging community.’ As Irving says, these are sweet and literary and decent people, good and imaginative writers, who have a sensible preference for fiction and creativity over politics. My first reaction was that it was a bad decision for Blackwell’s to organise anything with the PSC, which represents some of the nastiest, most vicious people on the anti-Zionist left. Irving’s assertion about ‘Zionist campaigners’ trying to close down debate feeds into widespread, sometimes very dodgy assumptions about Israeli and Jewish power in this country. The whole concept of the night seemed to me kind of distasteful. However, it is their bookshop, and they should be able to put on any night they want. Harassing bookshop staff for a decision they haven’t made is a tactic of Islamists and whacko BDSers. 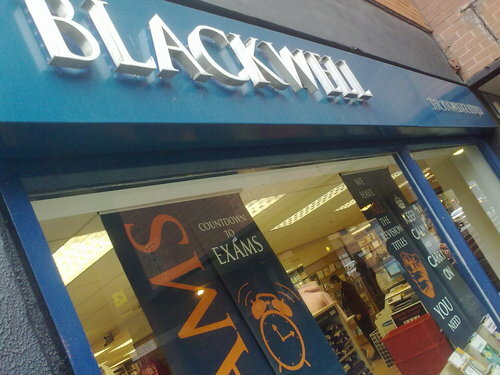 It is not acceptable for Manchester Blackwell’s booksellers (who are hardworking, literate, and not on high incomes) to be subject to threatening calls and emails. That Blackwell’s disinvited this group after such a short time shows they weren’t particularly involved in the politics Khalid represents. A booking was made by promoters of a book they were stocking. The local store obliged. That’s all. The event likely will go ahead at another location. All that’s happened is a bunch of grunts on the shop-floor have had a thoroughly rotten day. It’s easy to see why smart people prefer literature to politics. Update: The Manchester Evening News has the story. Today has been much calmer, although we are expecting much more publicity about the cancellation than we are about the event itself! Such is the way with these things. The weather’s still pretty good and Confidential have a timely feature on Manchester’s best bar smoking areas. The article features some places I know and love – Knott Bar, the Briton’s Protection where Succour does its launch nights – and some I’ve never been to like the Northern and the City Arms. As is pointed out in the comments, there are some startling omissions – Purespace, on New Wakefield Street, has an upstairs bar with three thick walls and a balcony, where you can smoke throughout; The Deaf Institute, the Oxford Road arm of the Trof empire, has comfortable balconies with heaters you can turn on and off. All these are great bars and deserve your support. You should see the ‘**** the Smoking ban’ mural in the Porters Ale House, Warrington, outdoor smoking area, complete with heaters, solid cover, extensive heating, access to the BBQ in summer, and closer to the toliets than those inside. A very proper solution for the largely smoking clientele of the pub. Can you smoke in prison? Yeah. Counts as a private residence. Like, if you stay more than one night in a hotel, it’s a private residence, you can smoke. I stayed in the Hilton when I saw Ricky Hatton and the guy asks if I want to upgrade to a smoking room. I’m like, nah, I just had a fag in this room. I can’t believe you went home with that fryer. Yeah, but you got a lift home at six in’t morning with a man selling burgers from a van! I mean, I go home with a fryer, you go home with a kebab seller, who’s the most likely to get murdered? The rest we know. Whether there were one million, or 1.5 million, or 2 million marchers, the event still stands as the biggest ever protest in British history. While the “Allies” wait in the desert for an uprising of Shia Muslims on the streets of Basra, the real uprising is taking place in hundreds of cities across the world. It has been the most spectacular display of public morality ever seen. ‘No, not because of sanctions, because of Saddam,’ she cried. A couple of local vignettes from this weekend. Friday night in a Northern Quarter bar. A guy with a nasal, ponderous voice, wearing an anorak and reeking of beer, informs me that he ‘doesn’t believe anything in the media’ – as if most people believe everything in the media. To support this he talks about the plastic shredding machine used in Iraq. People were fed into this either head first or feet first, depending on the severity of their offence. My interlocutor claims that this machine never existed and that it was a lie from the corporate media. I point out that the plastic shredding device has been well documented by people who’ve actually been to Iraq. The guy says that wasn’t his point because the machine was not being used at the time of the invasion. And so on. Yesterday, looking out of the Cornerhouse cafe window to see a couple of police motorbikes at the head of an antiwar demo. From 1-2 million in 2003, they now number less than a hundred; a few Respect and CND banners are unfurled. Kitsch causes two tears to flow in quick succession. The first tear says: How nice to see children running on the grass! The second tear says: How nice to be moved, together with all mankind, by children running on the grass! It is the second tear that makes kitsch kitsch. And no one knows this better than politicians. Kitsch is the aestethic ideal of all politicians and all political parties and movements. Whenever a single political movement corners power, we find ourselves in the realm of totalitarian kitsch. The fantasy of the Grand March … is the political kitsch joining leftists of all times and tendencies. The Grand March is the splendid march on the road to brotherhood, equality, justice, happiness; it goes on and on, obstacles not withstanding, for obstacles there must be if the march is to be the Grand March. What makes a leftist a leftist is not this or that theory but his ability to integrate any theory into the kitsch called the Grand March. The Grand March goes on, the world’s indifference notwithstanding, but it is growing nervous and hectic: yesterday against the American occupation of Vietnam, today against the Vietnamese occupation of Cambodia; yesterday for Israel, today for the Palestinians; yesterday for Cuba, tomorrow against Cuba — and always against America; at times against massacres and at times in support of massacres; Europe marches on, and to keep up with events, to leave none of them out, its pace grows faster and faster, until finally the Grand March is a procession of rushing, galloping people and the platform is shrinking and shrinking until one day it will be reduced to a mere dimensionless dot. Considering the hypocrisies and sellouts of the antiwar movement, I should have been happy that it has been reduced to a mere dimensionless dot passing down Oxford Road. But instead I just felt sorry for them. Overheard in a bar last night: a guy talking about a trip to Europe before the single currency kicked in. The old money was brilliant – the Deutschmark is exactly the same size as the British five pence. Worked in all the peepshow machines! Ladies and gentlemen, I give you humanity.